With spring finally here, it’s time to focus on healthy eating habits to get your body in tip-top shape for summer. However, this doesn’t mean you have to nix your favorite cakes and pound cake! Instead, swap-in coconut flour for regular flour in all your favorite recipes to enjoy baked goods, without the guilt. 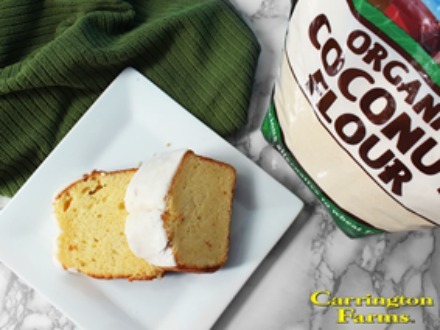 Carrington Farms Organic Coconut Flour is a great-tasting, flour alternative that is low in carbs and perfect for paleo and gluten-free baking. From muffins to scones and pancakes, this flour will be the baker’s best friend this spring. The following is a guest post recipe courtesy of Carrington Farms. Preheat the oven to 350 degrees F and grease a 7.5” by 3.5” loaf pan. In a mixing bowl, whisk the eggs with the coconut oil, maple syrup, lemon juice, and lemon zest. Add the coconut flour, tapioca starch, baking soda, and salt. Mix well. Transfer to prepared loaf pan. Bake for 40 minutes, or until a toothpick inserted in center of cake comes out clean. Remove from pan and cool completely. In a small bowl, mix together the coconut butter, maple syrup, and lemon juice for the glaze. Spread on cake.